Kolkata formerly known as Calcutta is a city of many hues, recognized by many as the Cultural Capital of India, known to others as the City of Palaces and to yet others as the City of Joy; it is difficult to capture its diversity as well as uniqueness within the confines of a single phrase. Located on the eastern bank of the river Hooghly, Calcutta was established by the British in an area where the villages Kalikata, Sutanuti and Govindapur existed.These villages were part of an estate which belonged to the Mughal emperor himself and whose jagirdari was held by the Sabarna Roy Choudhury family. The rights were transferred to the East India Company in 1698 and it became the capital of British Indian in 1772.The city grew under the British and saw the emergence of a new educated urbane Babu class in the 19th century. Calcutta becomes the pioneering center of socio-cultural revolution often referred to as the Bengal Renaissance. Calcutta also became the epicenter of the Indian independence movement, especially the revolutionary stream. In 1905 Bengal was partitioned on communal grounds which resulted in widespread public agitation and the boycott of British goods (Swadeshi movement). The British moved the capital to New Delhi in 1911 in view of these developments and also the fact that Calcutta was located in the eastern fringes of India. Through Calcutta lost a part of its political significance due to this decision, it continued to remain a determinant in the political developments in the country in the run up to independence in 1947 and a torch-bearer of the early industrial progress. It continued to play a very influential role in the cultural & literacy landscape of the country. In the fields of education , film, theatre & science, Calcutta has continued to play a stellar role. In 2001, the name of the city was changed to Kolkata to go with the Bengali pronunciation of the name. Today it is a thriving metropolis, hometo 4.5 million residents in an area of 185 sq km under the jurisdiction of the Kolkata Municipal Corporation. The Kolkata Metropolitan Area spread over 1750 sq km comprising 157 postal areas in 2006 has a population of approximately 14.2 million making it the 13th most populous urban city in the world and the 18th largest urban agglomeration in the world. The3 urban agglomeration comprises 72 cities & 527 towns & villages. The suburban areas of Kolkata metropolitan district incorporate parts of the districts of North 24- Parganas, South 24- Parganas, Howrah, Hooghly & Nadia. Kolkata is the main business, commercial & financial hub of eastern India & the northeastern states. It is also a major commercial & military port, & the only city in eastern India to have an international airport. Once India’s prime city, of late, the development of the has lagged far behind the needs of its growing population. Kolkata is in dire need to provide to its is citizens the best of amenities available in the country. The relative antiquity of Kolkata and unplanned growth has further exacerbated the problems of inadequate civic amenities in the city. Realizing the magnitude of this problem, the government is keen to put into place modern infrastructure and a number of agencies are working towards that goal. Only 6.2% of the area of Kolkata is comprised of roads compared to 20%+ for the other comparable metro cities in India. With a vehicle population estimated to be around 1.6 million and 23.50 million transit trips a day in 2011, the city is bursting at its seams. With very little scope to increase the road area in city and a projected vehicle population of 3 million and an estimated 32 million transit trips in 2025, the enormity of the problem is easily imagined. It was realized early that only road transport would not be adequate to meet the growing transport needs of the population and a rail based system for mass rapid transport is the most viable option to address this need. In 1949, the government conceived the idea of building an underground railway for Kolkata. The initiative had to wait for 2 decades when in 1969 the Metropolitan Transport Project was initiated. The master plan prepared by them in 1971 envisaged a network of 97.50 km consisting of three North-South corridors of which three were selected for detailed planning. These three lines were Dumdum – Tollygunge, Bidhannager – Ramrajatala and Dakshineswar – Thakurpukur. Based on traffic studies, the Dumdum – Tollygunge corridor was first selected for implementation and work started on 29th December, 1972. On 24th October 1984,the first stretch, a length of about 3.4 km between Esplanade and Bhowanipur was completed, the first metro line in India. 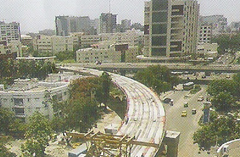 Over the years, others stretches on the corridor were gradually completed and some extensions were also made. This corridor was extended to New Garia as late as 2010. The people of Kolkata, enjoyed benefits of a modern metro system. In today carries about 5 lakh passengers a day. The master plan had already identified the corridor way back in 1971. The experience of India’s first metro and the success of the Delhi metro network contributed to the sanction of the East – West corridor connection Howrah Railway Station and Bidhannagar through an order dated 30th July 2008. Thus began the fascinating journey of building the East–West corridor, the line which would connect Howrah and Sealdah Railway Stations, two of the busiest railway stations in the world and which would pass through under Hooghly river, the first such river crossing in the country. A journey whose end is in sight, a journey which will give Kolkata its second metro; a metro the residents would be proud of.